These light and fluffy little chocolate cakes are sandwiched together by a creamy marshmallow buttercream. 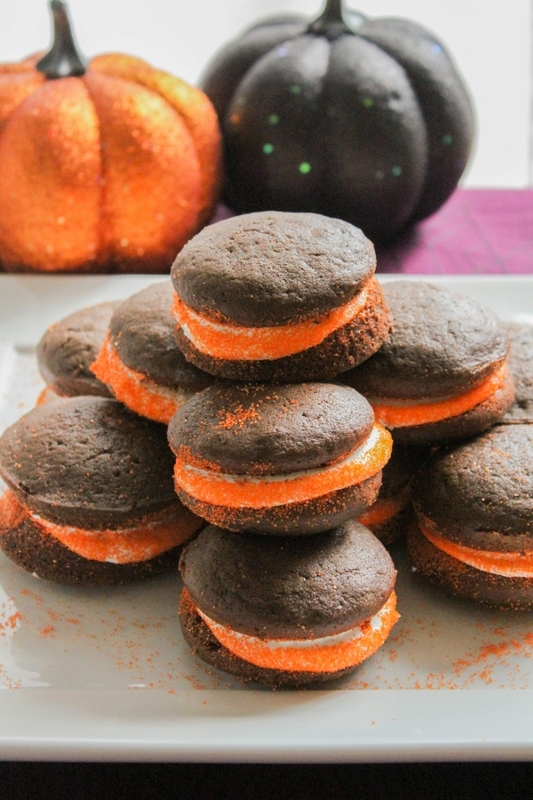 Adding orange sprinkles to the exposed frosting turns these Halloween Whoopie Pies into a fun and festive treat! Halloween is definitely one of my most favorite holidays. From the decorations to the costumes, haunted houses and corn mazes, it’s a time of the year that my whole family enjoys. Usually I can hardly wait until October 1st to pull out my decorations, and I’ve been known to start putting things up a week or so before that. It’s just a fun time to celebrate! My boys are grown up now, but I loved dressing them up when they were little. Some of my favorite pictures of them are from Halloween, dressed up as Buzz Lightyear, Winnie the Pooh, a lion, a fireman…the list goes on. Now I’m getting all nostalgic! I also love the food this time of year. It’s fun to make spooky snacks and treats, but I’m a bit obsessed with baking all kinds of good things. From decorated cupcakes and orange frosted brownies, I enjoy making a lot of different desserts and sharing them with friends and family. 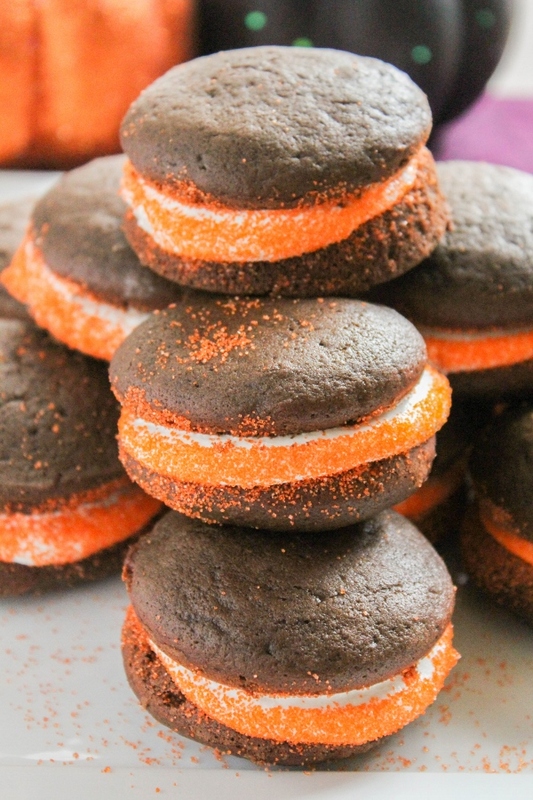 The newest recipe creation to add to my Halloween collection are these fun Halloween Whoopie Pies. They are so easy to make and are the perfect way to get the kids in the kitchen with you. The chocolate batter whips up in minutes and the cakes come out so light and fluffy. The vanilla filling is equally is simple, with just a few ingredients needed. 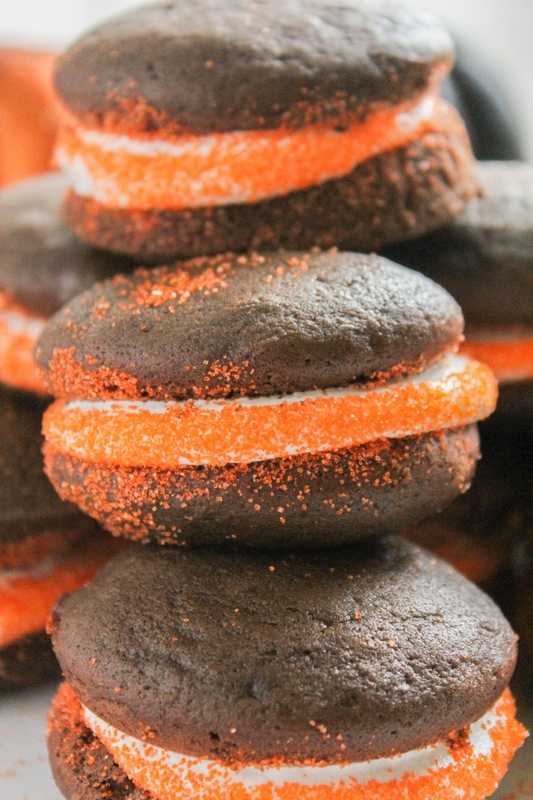 The orange sprinkles give them the perfect Halloween touch! No matter what it is that I’m baking, a staple in my kitchen is always Dixie Crystals sugar. Did you know they’ve been around 1917? That’s a long time! 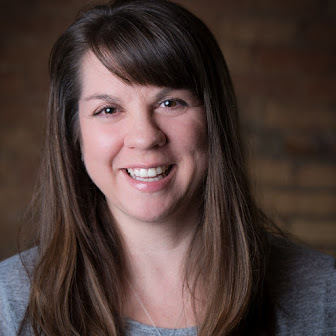 I love that their goal is to get families together in the kitchen and around the table making memories through food, because that is exactly the same goal that I have. I show my love through food, and there’s no better place than in the kitchen cooking with my kids, or sitting around the dinner table enjoying a meal. On the Dixie Crystals website you’ll find 1000’s of tested recipes, baking videos, vintage cookbooks and more. 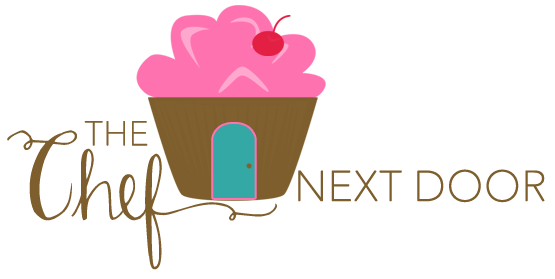 They also have a “Kids in theKitchen” section where you’ll find hundreds of kid-friendly craft ideas, printables, edible art projects, activity sheets and sweet science projects. There is really something for everyone! Dixie Crystals is having a super fun Scary Scramble Contest going on right now - unscramble the words for a chance to win a Kitchen Aid Mixer! Who wouldn’t love to win a brand new shiny mixer? I sure would! Be sure to head over to play. 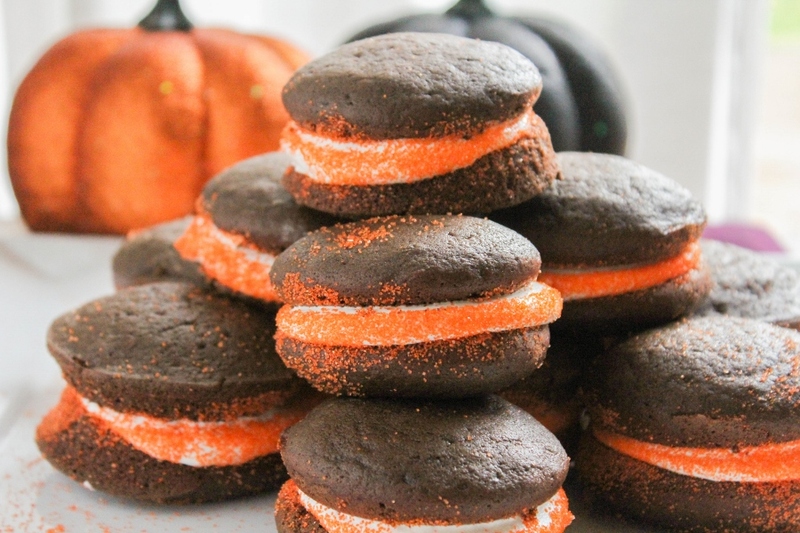 Are you ready to get into the kitchen with the family and make these Halloween Whoopie Pies? Let’s get started! Preheat the oven to 350 degrees. Spray a whoopie pie pan with non-stick baking spray. Alternately, line two baking sheets with parchment paper or a silicon baking mat. In a large bowl, whisk together the flour, cocoa, baking soda, and salt. In a glass measuring cup, whisk together the milk and vanilla. In the bowl of stand mixer, beat together the butter and sugar until light and fluffy, about 2 minutes or so. Add the egg, beating until combined. Reduce the speed to low and alternately add the flour mixture and milk in batches, scraping down side the sides of the bowl as needed. Spoon the batter into the wells of the pan. If using baking sheets, scoop large mounds of batter onto the sheets, about 2 inches apart. Bake for 10 – 12 minutes, until the tops are puffed up and the cakes spring back when gently touched. Allow them to cool in the pan for 5 minutes before transferring them to a cooling rack to cool completely. While the cakes are cooling, make the filling. In the bowl of a stand mixer fitted with the whisk attachment, beat together all of the filling ingredients until smooth, about 3 minutes. To assemble the whoopie pies, spread a large tablespoon of the filling on the flat sides of half of cakes, then top with the remaining cakes. Press down gently so the filling spreads to the edges. Sprinkle the exposed filling with orange sanding sugar or orange sprinkles. Allow to set for about 10 minutes before serving. Stay up to date with Dixie Crystals news and recipes by following them on Facebook, Instagram, Pinterest, Google+ and Twitter!